Hi everyone! This week has been pretty busy/emotional for us as we adjust to some new things life has thrown our way. Because of this I know I have been behind on my runs. I did go to the PT gym once this week which I am going to chalk up as a success and I plan to go again on Friday. I haven't ran since last Friday when my sister and I did the Sole Sister 7 miler. We ran through town, it was pretty uneventful except for the fact we did it at 11:30 and it was scorching hot. I don't know why we thought that was a good idea???? So just when I was feeling a little bad about how my training is going, I came home to something that perked me up! An unexpexted suprise in the mail will always do that! 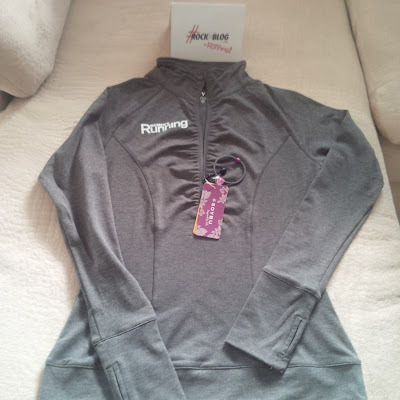 As part of the Rock n Blog team, I am participating in a collaboration with "Women's Running" Magazine and they sent me some great swag including this Zip up. 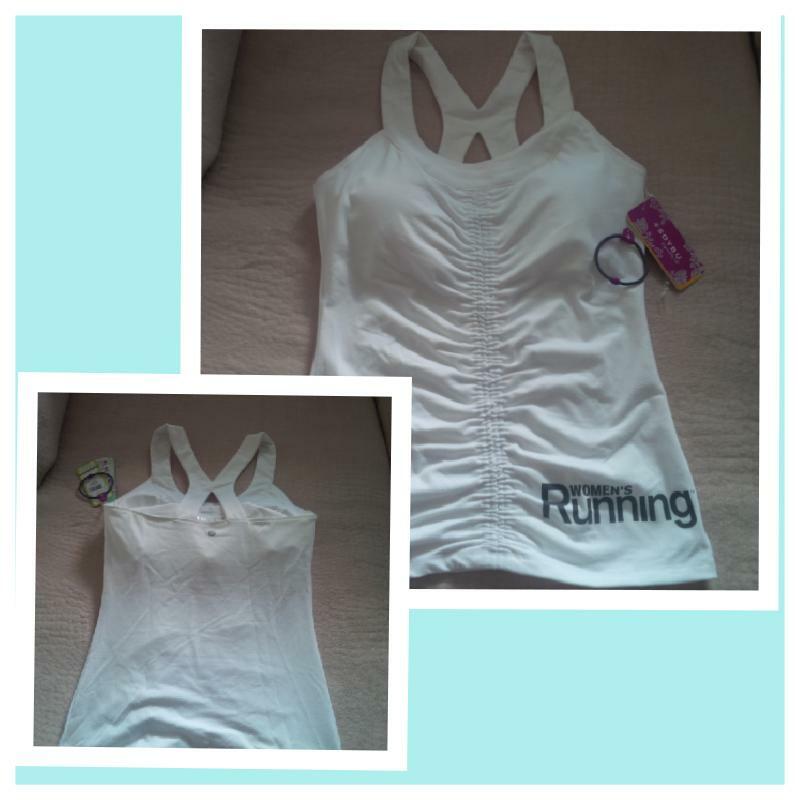 They also sent me this racerback tank. I think this is really cute and love how it has the Women's Running logo on it as well. Those round things shown in both pictures are actually hair ties. I was actually excited about those. Remember that was something I was hoping to get in my Beauty box but didn't. Having a rough couple of weeks myself! New clothes always helps. Have a great week! Maybe you will join us for the coffee date this weekend? This is perfect because my subscription just expired last month!!!!! I hope things are a good type of busy. New gear is a great pick me up. I love your gray quarter zip. That looks comfy and has cute details. I only subscribe to Runner's World Magazine and Tom subscribes to Golf and Sports Illustrated. We both love SI! I love getting new gear in the mail! I am waiting on something now- maybe it is in the mail when I get home! :) It is a definite pick me up! I hope all is well! Nice! I love both, especially the tank. I have been meaning to subscribe & this reminds me. Thanks for the discount code! I love new gear and definitely use it as a motivator, pick-me-up, and/or reward, especially when I start feeling icky about my long runs. Love the new swag you received, and I hope things are getting better for you. Hugs! Hope your doing okay, and adjusting to everything you have going on right now. We will have to chat soon! What an awesome surprise!! I got mine too!! I wore the white tank today and absolutely LOVED it!! The jacket and the tank are both super cute! When I started running, one of my friends started buying me subscriptions to running magazines and I am so far behind. You remind me that I need to get reading! I am missing out on all sorts of tips! LOVE that swag! Surprises like that totally get me motivated and amped for my next run! I have yet to burnout with marathon training (which I'm surprised) but knowing that race day is so close and our team singlets are coming in is getting me so excited! I subscribe to Runners World mag and Women's Health. Very cool. Always nice to get something like that, but even better when it comes at a time when you could really use the pick me up. 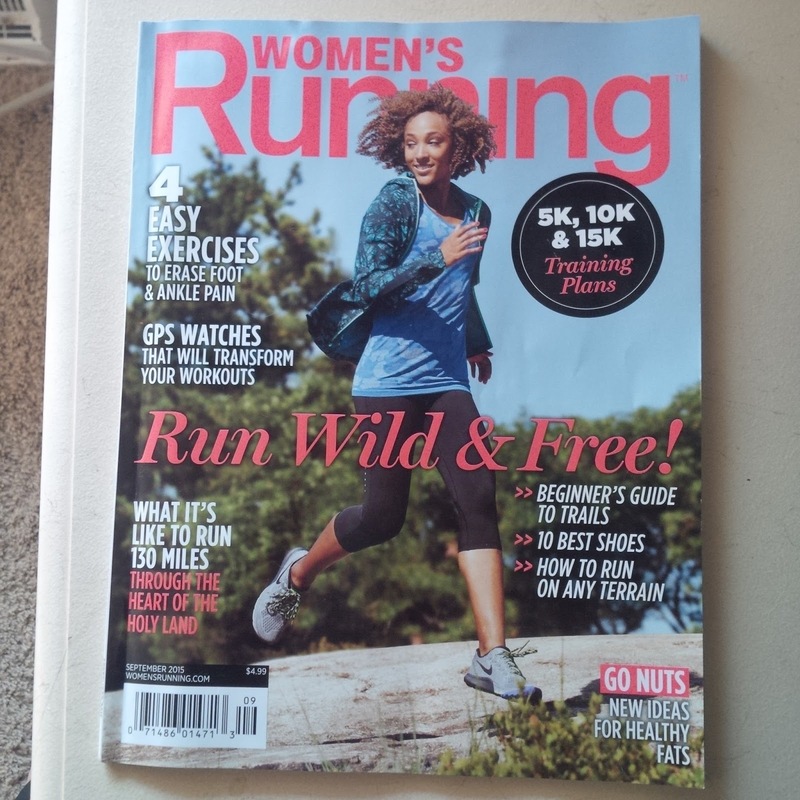 I haven't read Women's running but will check it out next time I am in the US. You can never have too many hair ties. I swear that I am always buying loads and they just keep on going missing. What a nice surprise!! Love the hair ties, too! :) That zip up looks super comfy! Why I'm feeling so defeated!